Did you know that for every pound of people on earth, there are 300 pounds of insects? Or that millions of years ago some of these bugs actually weighed that much? Well, during prehistoric times, before dinosaurs ruled the earth, bugs did; and just like today the seas, skies, and lands were covered by these creepy-crawlers. There were dragonflies with wings that reached a yard across in length, and millipedes that grew to over six feet long! But what is even more fascinating is the fact that all of these creatures in some form or another learned to adapt and survive to become the insects and sea beasts of today. In this fully illustrated picture book, readers will be captivated by the detailed information of prehistoric insects, arachnids, and their relatives. 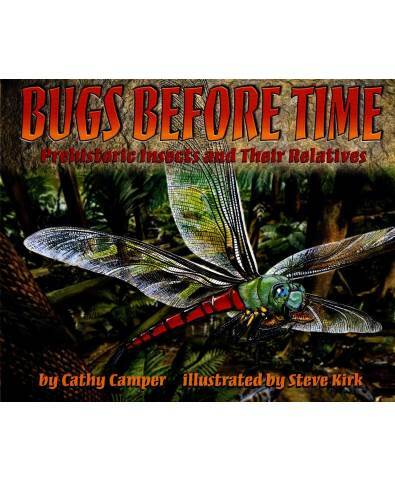 Chock-full of facts about fossil formation, insect evolution, flight theories, and geologic time, Bugs Before Time will mesmerize entomologists of all ages. Author Cathy Camper’s absorbing text, and artist Steve Kirk’s extraordinary paintings combine to re-create a world where giants reigned. Kids who love bugs will love this book! Get this title for your library. I promise you will not be disappointed. While the book would be good for a wide range of age and interest levels, it was particularly gratifying to find a well-written book for a smart kid.